Nearly 200 people rallied outside of the Prime Minister’s Office — on an unusually balmy fall afternoon — to defend our climate and oppose the Energy East pipeline project. “We’re just here to stop that, because we believe that it’s not a viable project. It’s something that will definitely put our communities, and our waterways, and our ecosystems in danger,” said south-end resident Sara Adams, 17. 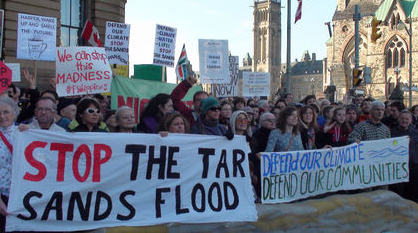 The protest began at the Centennial Flame on Parliament Hill then moved to the corner of Wellington and Elgin streets where participants, chanting “tar-free 613″ laid sandbags, stopping a symbolic oil spill. a national day of action called Defend Our Climate, Defend Our Communities, meant to highlight the growing opposition to tar sands expansion, pipeline risks, and climate change. The $12-billion pipeline project was endorsed by ﻿Prime Minister Stephen Harper when ﻿TransCanada Corp. made the announcement three months ago. A 4,500-kilometre pipeline will carry 1.1 million barrels of crude oil daily from Alberta and Saskatchewan to Montreal and Quebec City, then on to Saint John, New Brunswick. ﻿An existing natural gas pipeline would be converted to carry diluted bitumen for export. Running through Kemptville and Stittsville, “that pipeline crosses the Rideau River. That’s definitely a concern of ours, because if we were to see a crude oil spill in that river, that’s a source of drinking water for many, but if we were to see a diluted bitumen spill in particular, that has even heightened risks,” said ﻿Andrea Harden-Donahue from the Council of Canadians. Interprovincial pipelines are regulated by the federal government. Following British Columbia’s lead, Ontario’s Energy Board is holding public consultations on the proposed pipeline, provincial energy minister Bob Chiarelli announced Nov. 13. “There’s not enough of a review process and we’re here to stop things like this from going through really quickly,” said Adams. Petra Bucenieks lives near Bancroft and said she rented a car to attend the protest. “Mother Earth is a real being to me and (all the) indigenous people know that,” she said. Visit EnergyEastPipeline.com for more information.